The contemporary Dallas, Texas blues scene has been well-documented by many excellent recent CDs from both Cannonball and Fedora Records. One of the busiest session players in Big D, guitarist Hash Brown, gathered many of the area's finest blues cats in the studio for an epic session. The result is the surprising Hash Brown's Texas Blues Revue, one of the best blues and swing CDs you'll hear this year. This disc was originally released in Holland on Double Trouble earlier this decade, but the newer CD has been re-mixed for much better fidelity and one additional cut. Guest vocalists include the inimitable Sam Myers, the late blues shouter ZuZu Bollin, and soul/blues crooner Darrell Nulisch. Hash Brown also sings on one number, the slow blues "Mistreated Blues ('T' Is For Texas)". This is more than just a throw-away cut. Brown is a fine vocalist, and I'd like to hear more from him. I was a big fan of Zuzu Bollin, who sadly passed away just as he was making his comeback from musical obscurity. (Be sure to check out his utterly fantastic CD on Antone's Records!). So, of course, the cuts featuring Bollin's deep, booming vocals are among my favorites, including "Hey Little Girl" and Lester Williams' Lone Star classic "I Can't Lose With The Stuff I Use." This CD also captures Sam Myers, best known for his work with popular Dallas band Anson Funderburgh & The Rockets, at his best. I especially liked his vocal work on "Dog In A Man (Ways Of A Man)," which he also recorded with the Rockets. Myers' harmonica playing is also particularly crisp and clean on his own slow blues "Sad And Lonesome." Another good slow number, "My Daily Wish Is," features strong piano accompaniment from Matt McCabe and nice guitar from Brown. Nulisch, who leads his own Dallas-based band Texas Heat, is featured on the slow Texas blues of "My Baby's Gone" and the novelty jump blues of "I Sat And Cried." But in the end, this is really supposed to be Hash Brown's show. And he wraps up the disc in fine fashion with two smokin', jazzy guitar instrumentals, "Hangin' With Terry" and "Honey Boy." Extremely tasty! Most of Dallas' regular session players, including a tight horn section and some fine keyboard players, make up the band on all cuts. 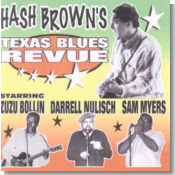 Without a doubt, Hash Brown's Texas Blues Revue is a keeper.